This 5′ x 6’9 Play-Plus Parsley Cottage Playhouse is just as cute as a button and has a very classic and fun style to it that would make it a dream playhouse for every child. 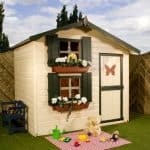 There is just so much to love about this playhouse starting with that adorable, picket fence with its porch and canopy to protect from the rain or provide some shade on a hot summers day. Two windows and a barn style door allow for a lot of natural light to get into the playhouse and in all it just has so much personality that it really is impossible not be impressed with it the first moment you see it. 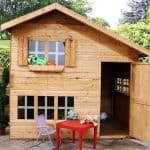 Clearly this is one fantastic looking playhouse, but it has also been made to meet all child safety regulations and made with the finest materials. With solid, tongue and groove cladding making up the walls to make it strong and safe, an apex roof to protect against rain and look good doing so and even the windows have been designed with safety in mind as they are made with safety styrene. Looks and style make this a playhouse that the kids are going to have a lot of fun with, but the great materials and design let the adults know this is a safe and long lasting place for the children to enjoy. 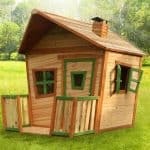 This Play-Plus Parsley Cottage Playhouse is going to stand out wonderfully in any garden, but best of all it is going to provide years and years of fun for the kids. This has just such a great and almost classic, Little House On The Prairie type look to it that when you see it for the first time you just saw aww. This is a perfect sized child’s playhouse offering the kids, 6 feet 4 inches of depth and 4 feet 8 inches of width. The height is just ideal with the ridge of the playhouse being, 5 feet 1 inch high. This playhouse looks great, but it also provides a lot of space inside for the kids to have some fun with. One of the first things that you notice about this playhouse is that drop dead gorgeous picket fence that is outside it. This is a huge part of the charm of this playhouse as here the kids have a lovely little, verandah canopy so that on a nice summers day they can sit out on their porch and enjoy themselves there. The kids can either just sit and play on the ground or you can add some decking. The roof is an apex style roof which we love as it does add more headroom, but it also make this look far more like an actual little house. It will stand up against the rain and make it so there is no worry of water getting inside. Play-Plus are using 8 mm thick boarding which is then covered with some high quality roofing felt to add protection and just finish it off perfectly. To help give the playhouse a somewhat, old timey and classic look, Play-Plus have used some very interesting looking tongue and groove cladding. We think the wood they have chosen here looks fantastic and at 12 mm it is more than durable enough to be able to take a bit of rough play from the children and also make sure no matter how bad the weather is that it will stay outside. A good solid and long lasting frame has been used here to make sure that amazing looking tongue and groove cladding has all the backup it needs to ensure a long lasting playhouse. Using the same kind wood that has been used for the cladding, Play-Plus have made this frame so that it will stay strong and keep its shape for many years so that your kids will always be able to enjoy the playhouse safely. We love to see a strong frame on a shed and especially on a playhouse as we know it means that the structure will stay solid and safe. The kids are going to be running around, hosting tea parties and getting up to all kinds of fun and crazy shenanigans inside here. To be able to deal with this the flooring has been made with the same style of boarding which is used for the roof. These are those 8 mm thick boards and we feel this along with the very well placed out and durable floor joists are going to allow for your kids or grandkids to really fill this playhouse up with toys, furniture or even a whole bunch of other kids. As is the case with most playhouses or sheds these days the Play-Plus Parsley Cottage Playhouse will be dip treated before delivery. Now this is a great way to protect the playhouse during transit, but you will then want to use some wood treatment once it is built. This then should be a yearly job to make it so the playhouse can be kept in top condition for a lot of years. 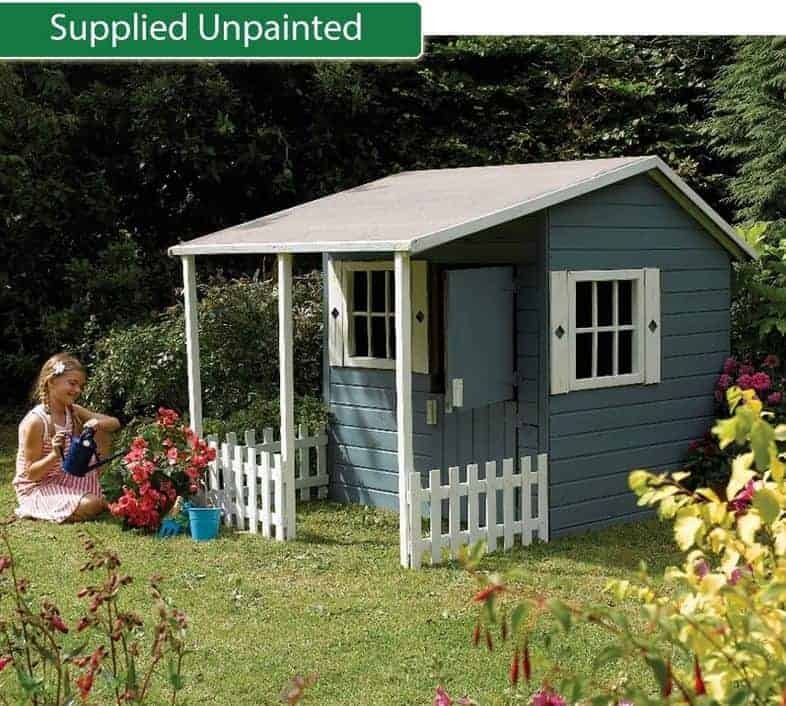 You really do get a fantastic warranty with this playhouse. You get 15 years protection against rot or decay of the wood as long as you treat it. We think this is just fantastic and one of the better warranties we have seen. The porch, picket fence and canopy have just so much charm to them, but the door is also something that will make you smile. This is a single, barn style door and as soon as you see it can just picture a child peeking out over the top part of the door telling you all the latest gossip of what is going on inside their little house. This is a very good sized door to make it easy for the children to get things in and out of the playhouse. There are two windows on the playhouse with one on the front and then another right on the side. These windows have these very cute mock shutters on them and they are made with safety styrene so that they cannot smash and leave potentially harmful glass everywhere. The doors does not lock, but it does have child safety hinges and a magnetic catch to make it so the door does close securely, but also make sure you do not have to keep opening the door for them. We do not think a lock is required as that would take away your child’s ability to just come and go as they please. The two windows and barn style door will let people be able to see into the playhouse with ease. 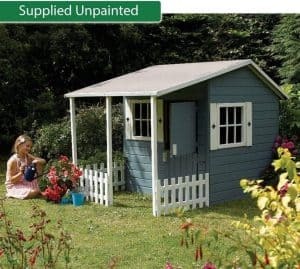 Now on a shed or an adults summerhouse this is something that would maybe not be wanted, but kids will love how people can easily see what they have inside their playhouse. And if they do not, well just add a little set of curtains and they will be fine. Honestly we feel that from the outside this playhouse offers just such a fantastic, cute and unique look that you really should not want to be doing anything to it anyway. However if you want to maybe spice it up just a little bit then look into using a coloured wood treatment. The only extra that you really need to consider is if you want to add in decking for underneath the canopy. 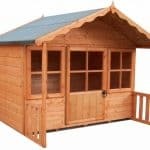 We just love how high quality and great this playhouse looks and we think that everyone who buys it will be impressed with just how top quality everything about it is. As long as you treat the playhouse we think that the kids will be able to use this until they are too big to fit inside. The amount of room to play with inside is great and we think that the added little bit of extra space you get outside the playhouse is just fantastic. In all the kids are going to have an amazing time making use of all this room they have. This is not the hardest playhouse to put together we have ever seen, but you are still going to want a friend to help you out and it should take no more than a few hours. Just be sure to follow the instructions and you will be doing great. 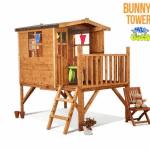 At a little over £300 we feel that this playhouse, for the amount of years it will last and the fun the kids are going to have with it, offers fantastic value for money. Final Thoughts: We have looked over this playhouse numerous times now and we always think how much we would have loved a playhouse like this when we were kids. 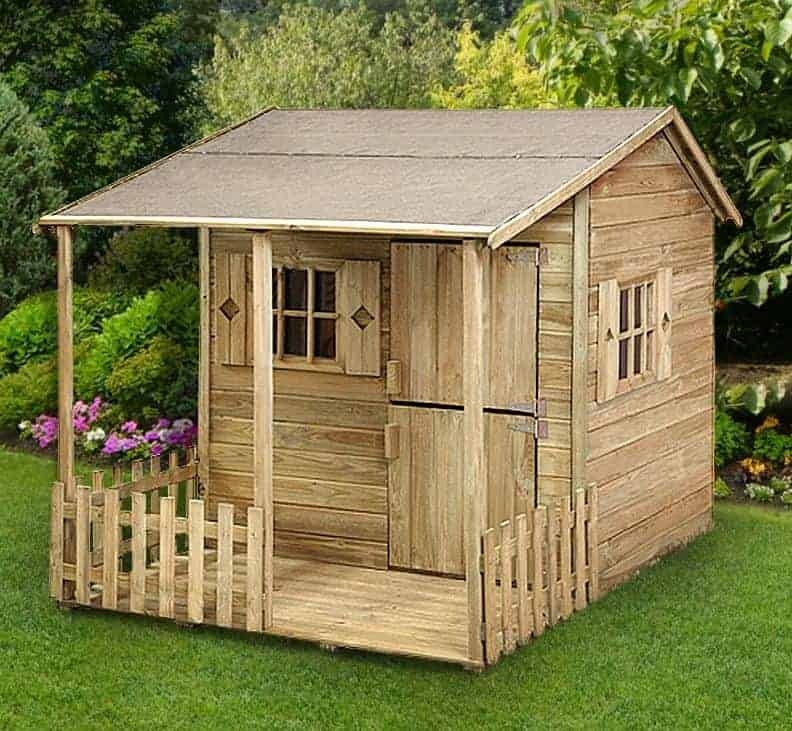 The 5' x 6'9 Play-Plus Parsley Cottage Playhouse has just so much style, class and charm that it will be something even when the kids are not playing in it that will make you smile when you see it in your garden. It has everything a kid could want, but it also has been made with safety in mind to give parents and grandparents a good peace of mind. 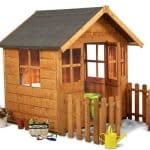 We really like this playhouse and have no doubt that the kids will love it and you will love watching them enjoy it too.